In Enid Blyton's book "The Children Life of Christ", Pilate released Barabas while Jesus was taken by the soldiers to be cruelly broken. The soldiers dragged him to their barrack and beat him up. They mocked him. They taunted that a man called The King of Jews have to have a crown and a sceptre. They stripped Jesus clothes and made him wore a scarlet robe. Gave him a chair as a throne. Then they gave him a crown made of something thorny. They put it roughy on his head. A piece of stick was given to him as scepter. One by one the soldier went up to him pretend to bow and then they spat at him. Some used the "scepter" to beat him. The soldiers then brought him to Pilate. He was in a very pitiful condition. Pilate thought if the people saw Jesus pitifulsight, they might want him to set Jesus free hence he brought Jesus to the people. Unfortunately, their hearts were frozen cold and they kept insist that Jesus be crucified. Some of them felt that Pilate is trying to help Jesus and they started to say that Pilate is no friend of the Emperor. Pilate was afriad so he let the Chief Priests to have Jesus. They led him away to be killed. In another case, Mamarazzi and me finally drag out our Christmas Trees from the store room . Big one is for the family. While this small small tree is for me. I sure had fun decorating my tree. I can't wait till night time to switch on the light on the Christmas Tree. I had a afternoon nap. When I woke up, I was excited as it was dark. Time to on the Christmas Tree lights. I siap instruct Mamarazzi not to touch as I wanted to on the lights by myself. Jeng! Jeng! Our big big christmas tree. 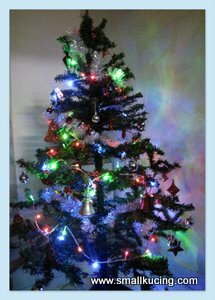 Here is my small small Christmas Tree. I let Mamarazzi to "help" me with the decorations. I like my small small tree but I like the big big tree better . Coz bigger tree, Santa can leave bigger present for me(LOL). Wait ah I see got snow down there or not...LOL....he is just too clever! I loved the videos! Your little guy is such a cutie. What a fun time of year. And the first story is a hard one to read, but so important. Nice tree. My girl doesn't even have one - old one somewhere in the store...dunno how to get in to take it out as the mum sumbat all kinds of rubbish inside...so no need lah! 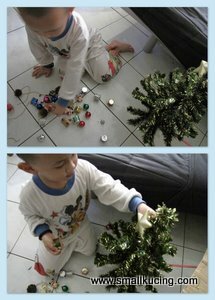 Yes, its about time the Christmas tree came out and sure must been a wonderful fun for your son in decorating the tree. :D He looks happy!! 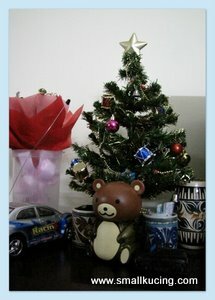 :D Yea~ my mom readied her Christmas since weeks ago. 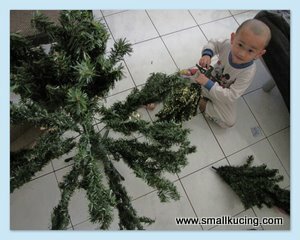 Did Small Kucing request what he want for Christmas? look so cute!! 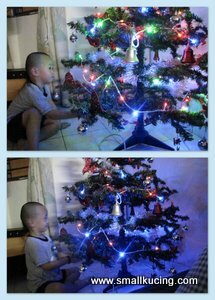 he he he i love the x mas tree pandai nya dia..
hehhe...is up finally. Need to top up more pressie jor.LOL!! Aw I love the tree! It came out great! I'll have a small tree for Aurora to decorate next year... I can't wait! Have a great Christmas!